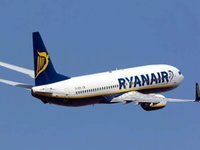 Ryanair, the largest European low cost airline, on September 3 will launch the new flight – from Kyiv to Berlin (Schönefeld), the press service of the Boryspil international airport has told reporters. "On September 3, 2018 the Boryspil airport will launch the first flight of the Ryanair airline Kyiv-Borispil - Berlin-Schönefeld," the airport said. The airline will operate four flights a week on this route. Taking into account the flight to Poland's Bydgoszcz, Ryanair offers flights from Kyiv to six Polish cities and one destination each to Germany, Spain, Lithuania, Slovakia, Great Britain and Sweden, as well as two destinations from Lviv to Germany and Poland and one to the U.K.